Sexism? Check. Racism? Check. Bigotry based on Sexuality? Check. It seems like the Democrat Party sure knows how to alienate people while putting their ugly, bigoted beliefs on full display. No, the most important requirement was that the applicants not be heterosexual, white men. A recent job posting from Data Service Manager, Madeleine Leader, advertised various positions in the DNC technology department. However, after telling those interested that they were hoping to build a diverse staff Leader wanted those interested to know that she “personally would prefer that you not forward to cisgender straight white males, since they’re already in the majority.” Apparently, she didn’t want the staff to be so diverse that they would include straight, white men. 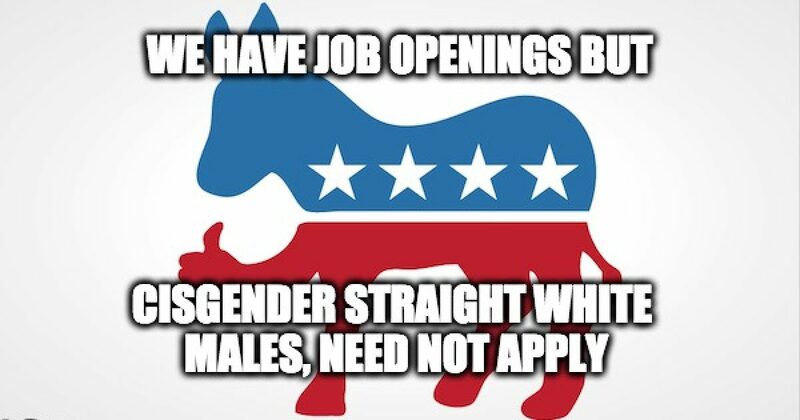 Interestingly, this bigoted message isn’t just illegal as it flies in the face of federal hiring guidelines… it’s also against the DNC’s own policies. Clearly the DNC is doubling down on a failed strategy that has alienated staffers and voters alike. We want to be judged based on the quality of our work, not on identity politics. How can we trust the leadership of the DNC if they don’t even trust us?